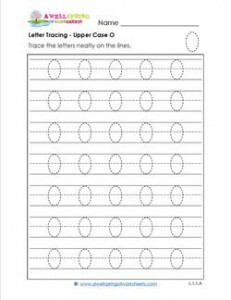 Here is another letter tracing worksheet with an oval shape. Unlike C, G, and Q, this O is the oval of ovals, plain and simple. No open shapes or little added lines. Go to this page to see all the letter tracing upper case letters in this set.